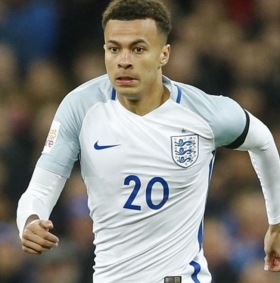 On November 17, 2015, Dele Alli made his first start for England senior team, scoring the opening goal from a long-range shot to beat Spurs teammate Hugo Lloris in a 2-0 win against France. Since then, he has been an integral part of the England National team and one of the few to have a secured spot in the starting XI. During his first campaign for Spurs he was named PFA Young Player of the Year and in 2016 and he was ranked as the best U-21 talent by FourFourTwo due to his amazing performances for club and country. However, this season he has been a shadow of his former self with below par performances; scoring only 6 goals in 29 appearances this season in Premier League. Alli has also in the process picked up 6 yellow cards already this season and missed three Champions League games due to suspension. Jesse Lingard has burst on to the scene this season, playing his best football so far in his career scoring 8 goals this season to Alli's 6; but in less than half of the time on the field to Alli. Lingard also has a shooting accuracy of 45 percent, more than 20 percent better than Alli and also contributed more in defense with tackle success of 70 percent. He started in both recent international friendlies, even scoring the only goal against the Netherlands and then went on to provide an assist for Jamie Vardy in a 1-1 draw with Italy. Jesse is also known as a big match player by Manchester United fans, stepping up with the winner in FA Cup Final and scoring goals in both the EFL Cup Final and Community Shield last season. There is no bigger occasion than the World Cup. Lingard has only just emerged from the shadows but has shown that he can score important goals under pressure and that is what separates him from Dele Alli. Both like to play in same position behind the striker and both are talented but on account of recent performances Jesse probably comes out on top. While both will be eager to play their part in World Cup at Russia this year, this has created a dilemma for England senior team manager Gareth Southgate. Now it's up to Southgate to choose which player fits better in the starting XI and can help the team to perform.